Modelling - e.g. "What are the key components of diversification models?" Evaluation - e.g. "How can a better evaluation experiment for diversification be structured?" Applications - e.g. "What are the key applications for diversity in commercial search?" Presentation - e.g. "How should diverse results be presented?" Technical and position papers on each of these four topics are invited for submission before 20th February 2011. In the workshop program, these will be presented, before breakout sessions continue on each of the four workshop themes. The program for the workshop is now available. In particular, the DDR workshop will have 3 plenary sessions, a poster session and breakout groups. We are proud to announce Tetsuya Sakai (@tetsuyasakai) and Alessandro Moschitti as keynote speakers in the workshop program. The workshop proceedings, consisting of 2 invited papers, 5 technical papers and 4 position papers is now available. For the contents, see the list of accepted papers. DDR 2011 will be co-located with the 33rd European Conference in Information Retrieval (ECIR 2011) in Dublin, on 18th April 2011. The venue for the workshop is the Guinness Storehouse. 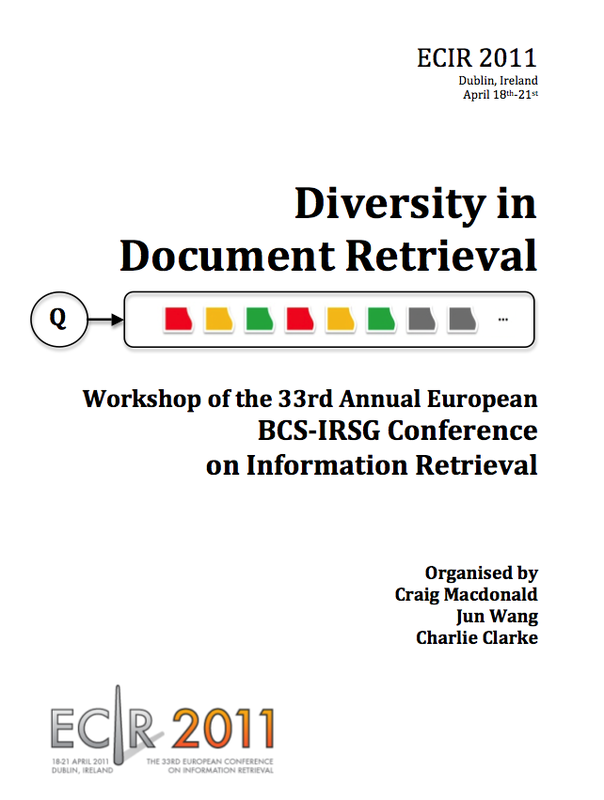 To attend DDR 2011, please use the ECIR 2011 registration system.